Poltava, February 7, 2019 – JV Poltava Petroleum Company (PPC) becomes one of the first companies to launch the system of liquefied petroleum gas (LPG) quality control in accordance with DIN EN 589. The PPC`s certified chemical and Analytical Laboratory has expanded its scope of competence by adding capabilities to measure LPG quality according to the standard DIN EN 589. “Automotive fuels – LPG – Requirements and test methods”. According to PPC`s experts, at the moment, it is the only private gas producer that has updated and expanded the competence to conduct measurements under the requirements of the mentioned standard. “Now the new capabilities of the laboratory are used to meet internal needs. The company is now able to independently analyze liquefied gas withdrawn from hydrocarbons of our own production and the third party income hydrocarbons– all in accordance with the new standard,” stated Andrii Dovhanyuk, Commercial Director of PPC. 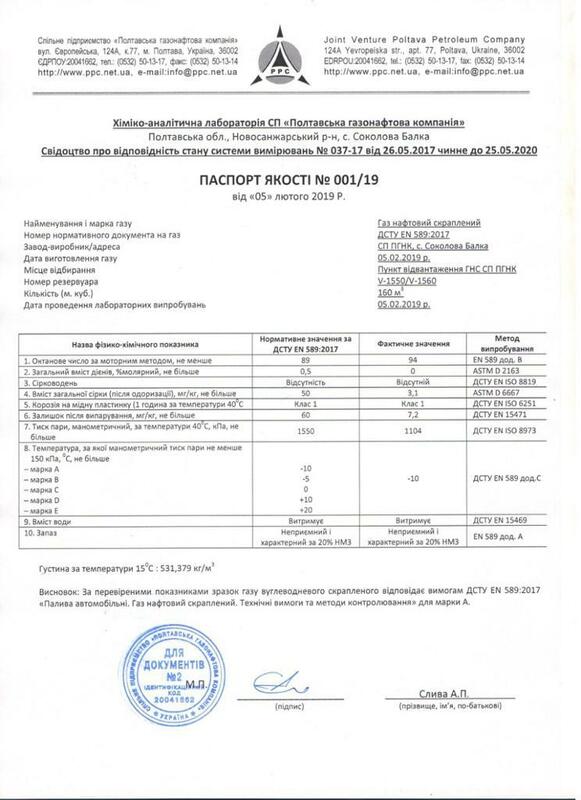 PPC switched to the production of liquefied gas under DIN EN 589 in February 2018 within the framework of harmonization of national regulatory documents with European norms, when the new standard was to replace an outdated GOST 27578-87 (USSR State Standard Specification). The company was the first among private gas producing companies to build a LPG plant in 2011.